The Thermopylae was built in 1868 at the shipyard of Walter Hood & Co., Aberdeen, for George Thompson’s “White Star Line”. She measured 212.0 ft x 36.0 ft x 20.9 ft and 948 tons net. 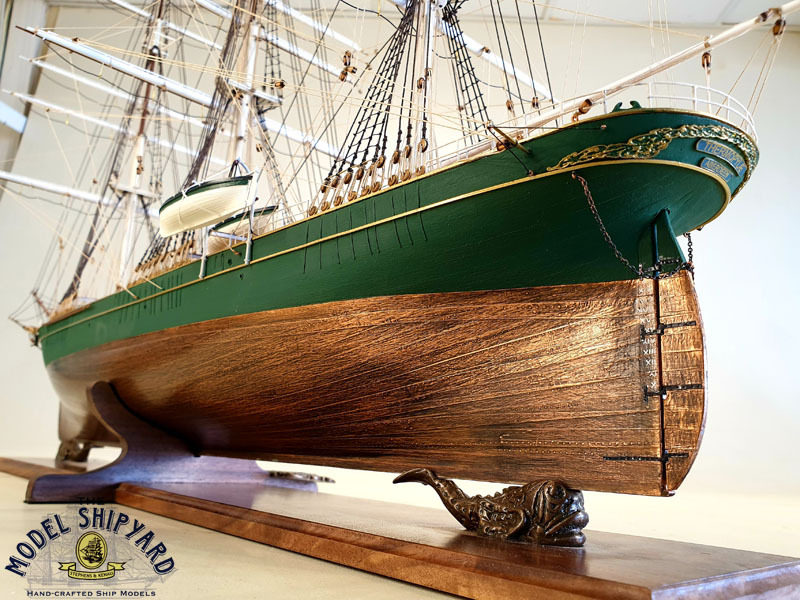 She was designed as an extreme clipper for the China tea trade and rigged as a three-masted ship. On her maiden voyage, captained by Robert Kimball, Thermopylae made a record crossing from Gravesend to Melbourne in 63 days. On her continued voyage to Shanghai she set another record between those two ports. Other startling performances were from Newcastle, NSW, to Shanghai in 31 days, Shanghai to London in 91 days and Victoria, BC, to Hong Kong in 23 days. 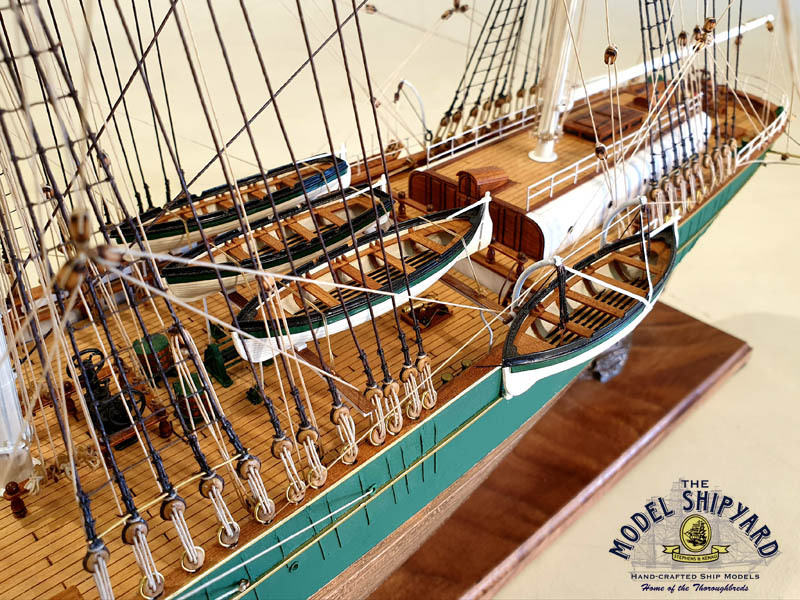 The Cutty Sark was built for John ‘Jock’ Willis whose ambition it was for her to be the fastest in the annual race to bring home the first of the new season’s tea from China. In 1872 Thermopylae left Shanghai with a cargo of tea for London in company with the Cutty Sark. After racing each other for two weeks the Cutty Sark lost her rudder after having passed the Sunda Straits. Thermopylae finally arrived in London only seven days ahead of her rival. Though the Cutty Sark made some good performances, she never managed to outrun the Thermopylae. quicker route not accessible to sailing ships, whose freights eventually fell so much that the tea trade was no longer profitable. So Thermopylae’s involvement in the China run was short lived, her last cargo of tea being carried in 1877. 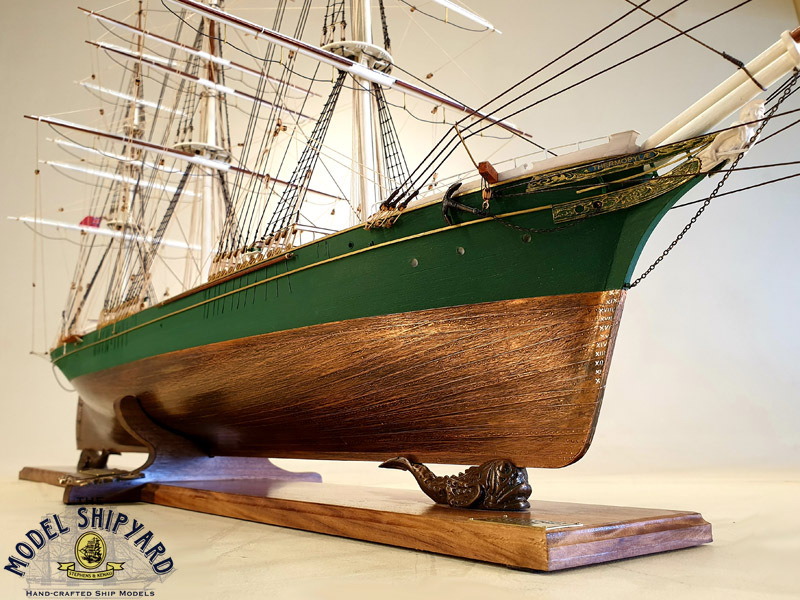 First sold to W. Ross & Co, London, then to Redford, Montreal in 1890, who rigged her as a barque, she was forced to seek cargoes in the lumber trade. In 1895 Thermopylae was sold to the Portuguese Government who converted her to a training ship and renamed her Pedro Nunes. Some sources have it that the Thermopylae came to her end in 1906 when she was torpedoed at sea by units of the Portuguese Navy. Other sources have it that she sank off the rocks at the Green Point lighthouse in Table Bay at the Cape of Good Hope. Yet another source has it that she was sunk by gunfire at the birthday celebrations of some Sultan or King. Be that as it may, though second to none, the Thermopylae came to a lonely and undignified end to sink beneath the waves which she so proudly battled for more than thirty years. Out of sight, out of mind. 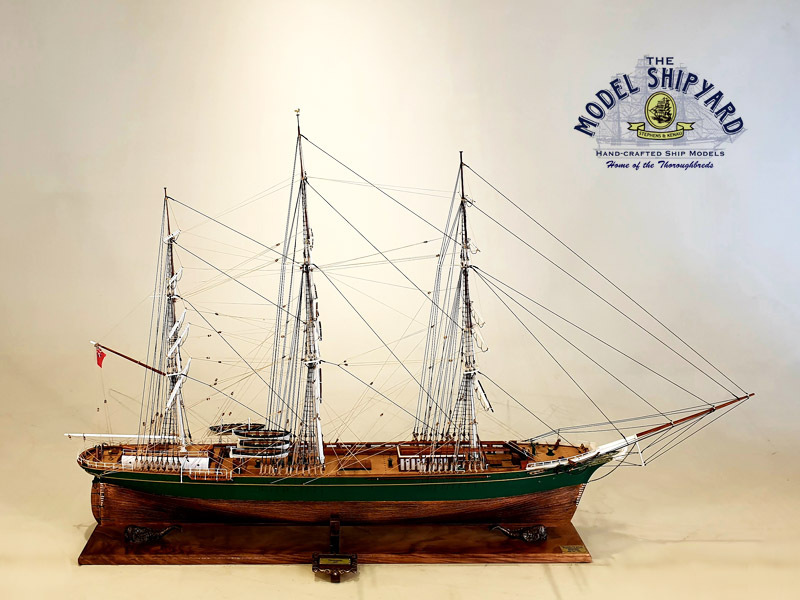 Though the Thermopylae was regarded as the fastest clipper ship to have sailed the oceans of the world, her memory lives on in the hearts and minds of only an informed few.